The groups conducted a survey amongst 2,300 employees worldwide, where respondents were between the ages of 18 and 65, worked 30 hours per week or more and were employed by an organization with over 500 employees. “In today’s environment where there is an alarming lack of trust in all institutions, employees are increasingly the key prism for brand credibility and trust,” said Micho Spring, chair of global corporate practice at Weber Shandwick. According to the report, employees are currently in a state of upheaval, with over 84% experiencing some kind of change in the workplace (change of strategy, leadership, finances), or in the process of some major events at work. 42% of respondents indicated their workplace was currently going through major lay-offs or acquisitions and mergers – or are in a state of crisis or disaster. Despite the unease, however, employees remain defensive of their organisations and their reputations, with 56% having publicly defended their company’s good name online or in print. However, the study found a disconnect between employers and employees, with less than a third (30%) of staff feeling engaged with the company. “Listening and responding are leadership skills critical to driving employee engagement,” said Weber Shandwick CEO, Andy Polansky. 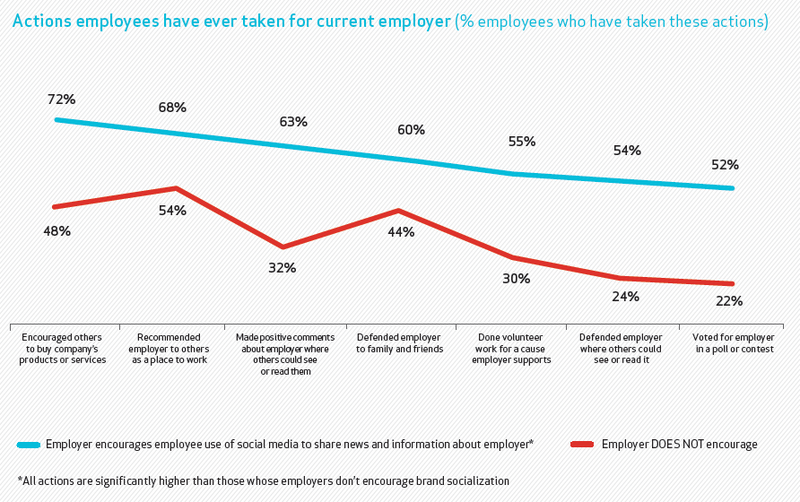 According to the report, social media has become critical to employee engagement and how it fuels employee activism. “Employees have multiple social platforms on which they can air their likes and dislikes of their jobs, bosses and organizations,” the report said. 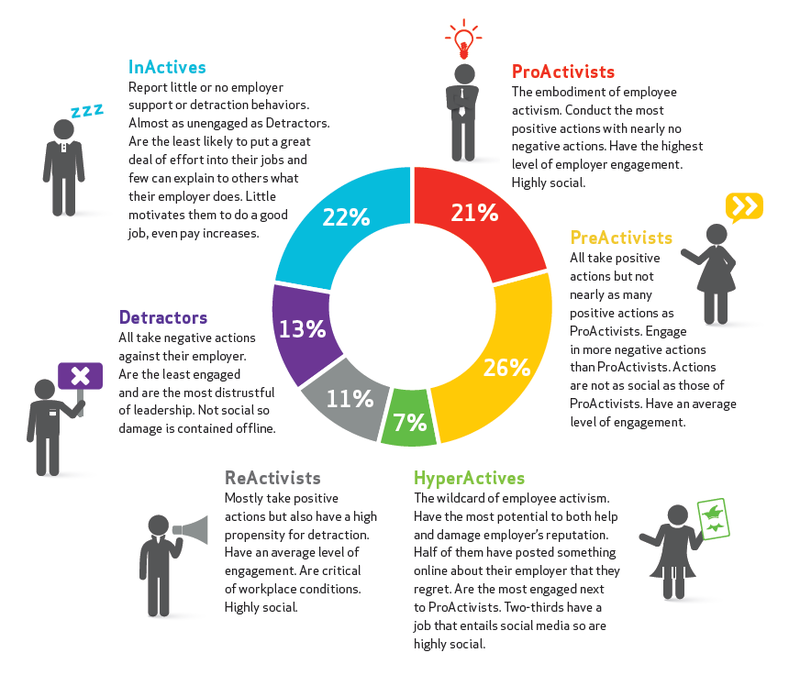 ProActivists – completely engaged, highly social and positive towards their employers. PreActivists – positive, but not as engaged and not as social as ProActivists. HyperActivists – wildcard in the middle-ground, with the potential to be positive or negative about their job. ReActivists – Positive, highly social and engaged, but critical of their workplace. 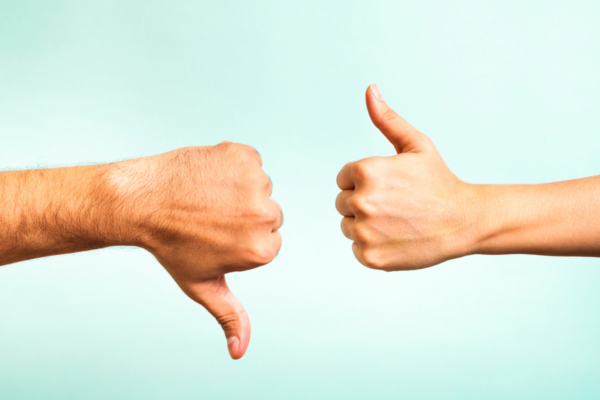 Detractors – Negative towards their job, least engaged, and not social. InActives – No engagement, unmotivated and disinterested in their jobs. The research group noted that by increasing engagement with their employees, and encouraging social – online and offline – positivity of the company and its brand, employees could be motivated to take positive actions for employers. “Our research proves that leadership has a catalytic impact on employee engagement and willingness to be an ardent employer supporter,” the group said.